He didn't speak until he was two and a half. When he eventually did, it was in full, grammatically complete sentences. He didn't ride his bike until he was nine. On one of his first rides, he rode down our street, out of our neighborhood, through town, and all the way to the local ice cream parlor. He didn't try a team sport (willingly) until he was 11. Then, he played three consecutive seasons of three different sports (we're just entering season three, and as far as he's concerned, we're only just beginning his sports career...). When he's interested in a subject, he becomes an expert on it. When he reads, he consumes an entire series in a week. When he's made up his mind about something, there's no changing it. Evan is a boy of cautious, deliberate planning and then fierce, stubborn determination. And now, this boy is 12. Headed to his first ever REAL ICE CREAM celebratory treat! ...and transformed into a bonafide Middle School Boy right in front of our eyes (with all of the wit, wisdom, sarcasm, rolling of the eyes, lack of self-control, grown-up conversations, lingering potty humor, and occasional full-grown man stink, that comes with this brave new world). This sometimes goofball is often serious--curled up neatly in his internal world. I've wanted, since he was a tiny kiddo who watched the world instead of sharing his thoughts, a peek inside that brain. He doesn't reveal much, but I can see the wheels turning and the message sinking in as he sits quietly through our increasingly regular conversations about drugs (WHOSE IDEA WAS IT TO INVENT JUULS ANYWAY? ), internet safety, school performance, growing up, and consent. He watches 60 Minutes, intently, with us on a weekly basis. Last week they aired a segment about the Battle of Attu, WWII's forgotten battle. As the correspondent introduced the segment, he said "We have all heard about Pearl Harbor, Midway, and Iwo Jima, but who among us learned about Attu?" Evan said, "I have!" and proceeded to give us the Cliffs' Notes version of the 15 minute segment we were about to watch. In addition to giving him a chance to show off his smarts, the show has also given us a lot of material to talk about with him and is one of the few "big kid" indulgences he enjoys apart from his younger siblings. These three tend to move as a pack. ...they seek each other out, then spend their quality time together bickering. Evan approached me the other day with a proposal. For his birthday, he wanted to download a new game for his Xbox. He had researched the cost to download, how the in-game purchases work, and the rating. He presented his proposal to me with this information, along with his wishes (to download the game for free), and the restrictions he would impose upon himself (to refrain from purchasing the add-on "coins" until he determined whether or not the game was worth it). I was impressed by the calm, measured approach to this ask. Just a year ago, he would have likely come to us begging, saying that "everyone else has it! It's not fair!" before we even had a chance to consider the request. I let him download the game and suggested that money for the "coins" could come from us as part of his birthday gift. He invited me to watch him play his first round...so I could make sure the game, "Rated T for Teen," was "appropriate." I think I can relax a little about this kid's ability to make good choices. Are the kids nice to him? Is he nice to them? What is he being exposed to? Can he handle it? Will he tell me if there's a problem he can't solve on his own? Does he know -- like reeeeeeealllly know -- that, no matter what, we'll always have his back? I've said it before in this space: I want a tiny, temporary glimpse into the crystal ball. I'm not wishing this time away and I don't need to know everything...I just want a peek. Where does he end up? Is he okay? Fulfilled? Inspired? If I were convinced by my glimpse that he winds up in the right place, whatever that place might be, then could I relax and enjoy this ride? Or am I destined to worry my way through parenting this child because of who I am...and who he is? He's our pancake kid. The one we'll burn a little or undercook slightly before we get the heat setting just right for the next one. He's the one teaching us how to be parents (even though the other two are teaching us how to be parents to them in their own right). He's the one we make mistakes on and the one we learn from. He's the one that, hopefully, will understand why we made the decisions we did when he has his own first born. That's one thing he knows for certain: he'll definitely be a dad. He might be in the military or a police officer or (the one I'm holding out for) a history professor, but he'll definitely have kids. Eight, according to him, if he's a billionaire. In that case, he'll have a party bus to drive them all around in. If he's not exorbitantly wealthy, then three or four kids. And a toy poodle. He's headstrong and opinionated and full of fire. He's a baby whisperer and a dog snuggler and every toddler's favorite Big Kid. He likes cuddles on the couch at night and back tickles at bedtime. He's grumpy in the mornings and has the most infectious laugh when he starts giggling. He can be Max and Molly's biggest nemesis and most favorite companion. He is everything and anything....and he'll be just fine. It's time to stop looking for the crystal ball and to start looking straight at this kid. In lieu of a party this year, Evan has elected to do an Escape Room with his aunts and uncles. After that, dinner and an arcade with the whole family. And for dessert, Smookies, of course. This growing up thing has its perks! But I still can't believe my baby is 12. Have you ever come to a realization about yourself that is so obvious and so mind-blowing at the same time? It happened to me a few weeks ago, during a Health Coaching session I had with my little sister. My youngest sister, Emily, graduated from college a few years ago and immediately started working as a fitness instructor while she pursued her certification as a Personal Trainer. You may remember that she offered me a personal training session during this time. It was, um, awesome. She loves personal training and excels at it, but she was ready to take her career a step further. She's currently enrolled in a post-graduate Health Coaching program through Emory University. She asked if she could conduct a practice session with me as part of her training. "Will this involve, like, burpees and tennis shoes?" I texted back when she sent me a message to schedule the session. "LOL" she wrote back. "Just talking! And you'll do 95% of it!" An hour of listening to myself talk? And not having to see any tween eye-rolling in response?! Sign me up! Emily started the conversation by explaining to me a bit about what a Health Coaching session is: A chance for me to identify any obstacles (whether emotional, physical, behavioral, or social) that stand in the way of me reaching my goals (whatever they may be) and to find a way through them. She also told me what it isn't: A conversation that will result in an answer she will provide. She was very clear: "I don't have a solution to your obstacles, you do." She started by asking me what area of my life I think I could be feeling better about. Some of her clients come to her with frustration about not being able to reach their health and fitness goals but, for me, who has no health or fitness goals, it's more emotional. I'm not as happy as I think I should be. Particularly as a mom. It's weird, seeing those words...almost as weird and sad as it was to speak them out loud. I think most people assume I'm a pretty happy and content person. I can be fun and funny and engaging. I can turn on the charm. And I think it's pretty apparent that I love my kids and view myself, first and foremost, as a Mother. I don't feel depressed but, looking at my life objectively: great marriage, great kids, great job, great everything, I shouldn't feel as short-fused, impatient, and stressed as I do...particularly in my relationships with my kids. I feel as though the water is bubbling at the rim of the proverbial pot and the tiniest of my kids' infractions -- dawdling at bedtime, or a snappy response to my instructions, for example -- causes me to boil over immediately. Because I have such high expectations of them, I can be demanding of my children. I love my children and want nothing more to be with them...but when I am with them, I am not the happy, silly, Fun Time Mom. I'm the Schedule Keeper, Task Master, Clean Up This House I Can't Even THINK With All Of These Piles Everywhere mom. Give me a board game or a pile of Legos and I'll sit with you all day but ohmygod no, I can't play Puppy Sisters with you even for a minute. I often use a different voice to speak to my kids than I use with other people's children, and it's not a pleasant one. But then I revealed to my sister what I consider to be my greatest strength as a mother: I am so deeply and emotionally connected to my children that I view them and feel them to be direct extensions of myself. At that point, Emily gently steered the conversation to me, the person, beyond my role as a mom. She asked me about what made me feel the most happy, the behaviors I was engaged in when I felt the most contentment. I talked about my need for organization and control and how, when I feel organized and in control, I feel peace. I feel the most stress when the individual silos of my life (Mom Sarah, Wife Sarah, Work Sarah, Volunteer Sarah, friend/daughter/etc. Sarah) merge. When I'm working while the kids are home from school and I feel guilty for not being able to give 100% of my attention to either, for example, or when I'm too spent at the end of a day to even have a conversation with Sam, or when I feel like there is So Much that is Broken in this world and that I should be doing more to Fix It...but, like, I'm tired and I just want to sit. What makes me happy is when everything is Perfect and under total and complete control and my silos are neatly ordered and I'm doing an above-average job in all of my roles and people are demonstrably appreciative of my efforts. At some point during this part of the conversation, I said that I am a perfectionist and I have extraordinarily high expectations of myself. (This was not a revelation to either of us.) I give myself very little grace when I make a mistake. I gave the example of spilling something: Instead of laughing and thinking/saying "Whoopsy!" I'm immediately pissed. I'm angry at myself, ridiculing my negligence or loss of attention or control. "What I'm hearing," Health Coach Emily reflected, "is that you're not speaking very kindly to yourself and that, at the same time, you view your children as direct extensions of yourself." "Yes," I agreed, proudly reveling in that positive note she ended on, before the negative correlation between these two facts sunk in. If these are both true, which they are for me, this means that the demanding and harsh tone I use with myself is the same voice I use with my kids because I see them as such an extension of myself. And that, when all is said and done, is the habit I'm truly trying to change. We went on to talk about a few other things, including how I can practice merging my silos productively and responding to my feelings, whatever they are, with acceptance rather than disapproval, but it was that one big connection that I couldn't get out of my head for the next few days. I'M NOT ACTUALLY IN CONTROL OF ANYTHING. So how do I let my need for control go so that I can truly appreciate them as their own, fully actualized individuals? How do I respect their own senses of Self and still find peace, in the absence of having control? I don't know yet, but I'm trying to figure it out. I'm trying to look at them with fresh eyes...to recognize WHO they are, not just observe the behaviors that they are displaying. But it's hard. My need for order and control runs deep. I can't let that go entirely. Having a shared organizational system seems to be helping. We recently introduced a daily schedule to help with the morning rush and a daily/weekly chore chart to help me not feel like this house's Dobby. This gives them the autonomy to manage their own schedules within the system, while giving me a feeling of control (I created the system). A visual representation I recently learned from a friend who is a therapist also helps: We each have a gear. They are all different sizes. My small perfectionist introvert gear sometimes has trouble fitting with Max's big expressive extrovert gear. Max's gear is spinning big and all over the place forcing my gear to grind to a halt because it can't just spin in quiet, methodical peace. When we need our gears to work together, I can make mine way bigger to fit his (which I can sometimes manage because I'm an adult who prides herself on Complete Control of Her Gear) or he can make his way smaller to fit mine (which is reeeeeealllly hard for him to do...like trying to fit a foam mattress back in the box it came in) OR we can both adjust our gears slightly until they fit. I can be a bit more flexible, allowing his morning song and dance routine, while still maintaining the expectation that he is in the car, ready for school, when it's time to leave. Also, this time is short. I know it in my heart and I'm trying to repeat it to myself often. They're growing up so fast and this, right here and now, is my chance to get to know my kids in the unformed clay stage, their true natures, before they head out into this world to be shaped by what comes next. This, right here, is the sweet spot. And, in my quest for compliance, calm, and order, I'm missing the messy beauty that is my kids' self discovery. That was an incredibly powerful hour of Health Coaching. In the days since my conversation with Emily, I've been actively trying to reframe my relationship with my kids. I am trying to speak to them in a voice that honors their own individualism, disassociating them from being merely The Children of Sarah. Let me be honest: I'm not like this new Zen, infinitely patient and accepting, version of myself. Change takes time. But it starts with awareness and, now that I know better, I can do better. After I wrote this, I happened to tune into the latest episode of Oprah's Super Soul Conversation podcast. (It must have been the Universe intervening on my behalf...I've been on a Getting Curious kick and haven't listened to Super Soul in a few months.) On it, she featured the best-selling author of The Awakened Family, Shefali Tsabary. It echoed exactly the feelings I've been having since my Health Coaching session. It is a MUST listen to for all parents. Listen here (Search by release date 3/17/19). About a month ago, Evan's Language Arts teacher assigned a research paper. He was to choose an artist to research and become an expert on, then convey what he had learned in what ended up being a 9-page single-spaced paper. It was a Big. Deal. He selected Leonardo DaVinci and he did a great job on it. Then, as a culminating project, he had to recreate one of the Master's Masterpieces. This was going to be difficult. Evan, by his own admission, is not an artist. He doesn't like the subjectivity or the mess. I assumed he would sculpt DaVinci's horse, the one that was, famously, never completed because it was destroyed in a war. How apropos for my military history loving kid, I thought. Plus, a horse sculpture seems pretty simple to recreate. I mean, just get the basic shape down, the teacher doesn't expect DaVinci level perfection, right? 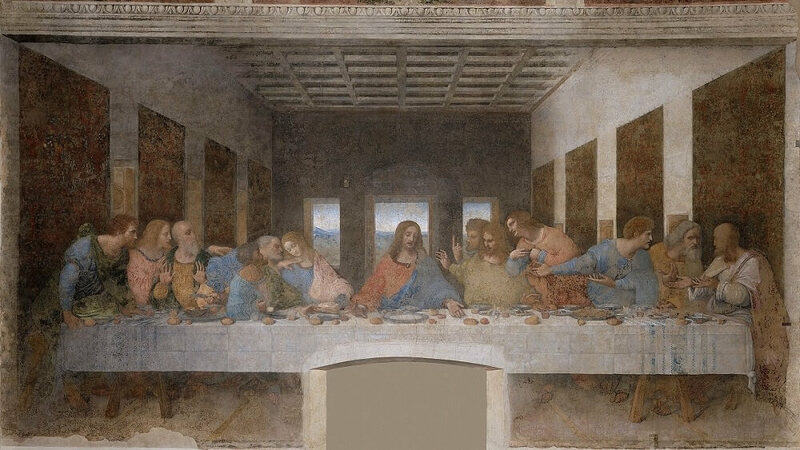 Instead, he decided to paint The Last Supper. "Wow, bud," I said, trying to mask my surprise. "That's pretty ambitious." "She said if the painting has a lot of people in it, we only need to do a part of it," he clarified, easing some of the concern I had for him being able to complete the project. 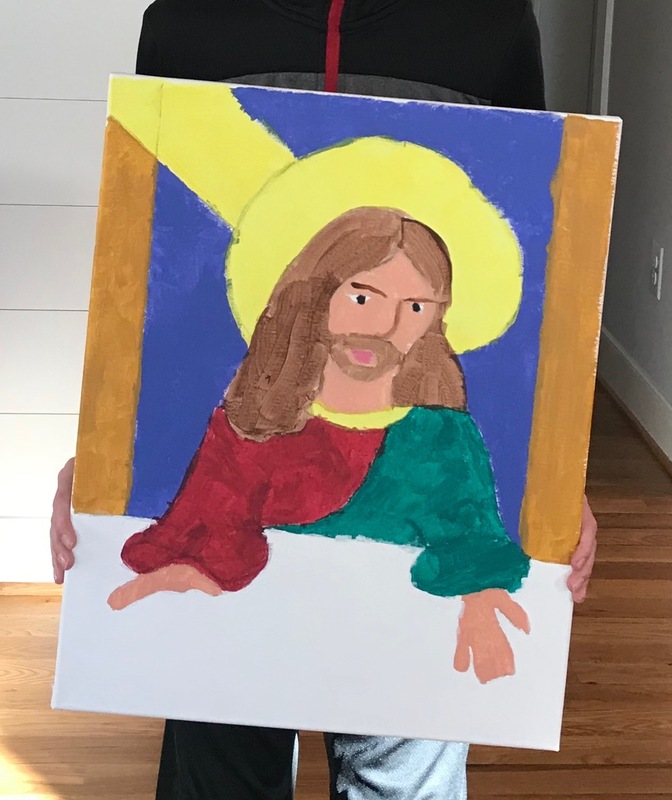 "And I'm going to make mine a Jesus painting." I couldn't help but smile. We were invited over to the home of a family who had recently moved into our neighborhood for a playdate. As the kids bounded down from the playroom, headed to the backyard, Evan noticed a painting hanging in their hallway. "Who's that guy?" Evan asked the mom, pointing. She looked at the painting, then at Evan, then at me. "Well, Evan," she said, with the faint hint of judgement in her voice, "that's Jesus." "Oh!" he responded. "I thought maybe it was somebody's uncle or something." We're not Christian, and that's unusual where we live. I think most people assume that we just haven't "found our church" yet or that we're "Christmas and Easter Christians." When I come out and say it, though, that We're Not Christian, people are often taken aback. Our kids have heard about Jesus, of course, but we talk about him as a historical figure...a good guy...a great leader. Evan thinks of himself as an atheist, Max doesn't think that there's a puppet-master God who has our whole lives already planned out for us, but hasn't labeled himself yet. I'm not surprised that Evan has, though. His skepticism began when he was three, attending a church-run preschool program two mornings a week. He came home from school one day and announced that his class had learned a new song. He went on to sing "He's Got the Whole World in His Hands," before demanding some further information. Who has the whole world in his hands? And why is he holding it? And, you know what, Mommy? That's not actually possible. He's a fact and figures kind of guy. Evidence-based proof. Historical data. He'll believe it if he can see it. And, he comes from skepticism. I renounced my own Catholicism when I was 16. I had had some unsettling questions and doubts about Christianity for years but hadn't wanted to admit them. (I was, and still am, such a Pleaser. I didn't want to upset anyone with my lack of faith.) As I got older, though, and started to learn of the politics, scandal, and hypocrisy rife within the Catholic Church, I couldn't keep quiet and I could no longer accept Communion. I took a smattering of World Religion courses through college. Nearly enough to have minored in it, actually. I was seeking. I didn't feel like an atheist...I felt as though there was something "out there" that was bigger than all of us and giving all of purpose...but I never found that one Truth that spoke louder than the others. There's a lot to admire in all of the world religions I studied, but in the end I settled on the "religion" of Science and Nature. We're all part of this one vast organism that is the universe; we are all connected and depend on one another and should, therefore, do right by each other. As for an "afterlife," well, I believe in the scientific principle that energy cannot be created nor destroyed. My life energy will exist in some form once my body dies, but I'm not really concerned about the particulars of where or how. Reincarnation? Maybe. It makes sense to me from an energy constancy standpoint. I don't know if it's as highly structured and based on the economy of karma as the Buddhist worldview posits. I do know that I carry the life energy of my grandparents and people with whom I was close who have died. I can feel it. I can feel them. Evan says he is an atheist. He probably is. I think he sees this world in black and white; truth and justice, action and consequence. It doesn't bother him that there is nothing "after" this life. This life is enough. Maybe he'll change his mind some day and seek an alternate Truth that feels right for him. Maybe not. He also says he'll never paint again. I'm not sure there's much truth to that, especially given the fact that he has been assigned to an Art elective next quarter. But, in this case, I hope he's wrong. I loved watching him struggle through this project...not for the frustration...but for the perseverance. He hated every minute of this project, but he nailed it. And I'm so proud of him. I think he's pretty proud of himself, too. She was born in the Year of the Dragon, under the water sign. Nothing could be more fitting for my Baby of babies. She is fiercely independent. Strong-willed and determined. She can tame the wildest of beasts! but always with a generous heart. Her compassionate streak runs deep. She is expressive and creative, yet quiet and introspective. She goes with the flow, yet she knows exactly who she is. She is at once ahead of her time--slamming doors and telling me that I'm "never nice" like the teenager she will become--and taking her time--still fitting comfortably on my lap and wrapping her arms around me to tell me she loves me "too tight." So are her lashes. My god. She'll be a veterinarian when she grows up. And a Mommy. The Daddy in her family will stay home with the kids so she doesn't have to take care of the animals AND the babies. Priorities, you know? She's still a vegetarian--for ethical reasons, only occasionally allowing herself to forget that bacon is meat. She cares deeply about this world and has a wise-beyond-her-years awareness of our current political, social, and environmental climate. Partly, this is my fault. I don't shelter her from my feelings about our president and his disastrous failings. But it's also just who she is. It was her idea, after all, to decide not to join Girl Scouts when she learned that Max wasn't allowed to join a troop. She didn't think it was fair. Social justice is in her blood. It's a strong one, that moral compass of hers. Her favorite movie is Black Panther. She saw it in the theatre with her Mom Mom and Pop. Her brothers opted out on account of scariness, but not Molly. "How'd she do?" I asked when it was over. "She loved it!" my dad reported. "She didn't cover her eyes once!" Her favorite letter is lowercase "g" because it's so fun to write, followed by "M" because, well, obviously. Her favorite foods are white: Bread and cheese. Carrots, red peppers, waffles, strawberries, peanut butter, and nuts round out the entirety of her diet. But she's starting to venture out. She'll eat spinach now (leaf by leaf, each dipped in ranch, leaving a tiny pile of spinach stems on her salad plate), and key lime coconut milk yogurt....so that's a start. She still can't say "pearl" ("puhh") and she still says /y/ when she means /l/. She still likes to be carried. What do spies like to put in their pies? She is a kind friend, an excellent student, an eager helper, and my favorite Sunday morning newspaper buddy. Give this child a modeling contract. I'll buy anything she's selling. One of my favorite things in life is watching you experience this world. You are joyful and curious, a seeker. You are kind and affectionate and thoughtful. You take risks and are not afraid to be the first one to reach out. You can be bashful, but you are brave. I am inspired by your confidence. Happy Birthday, Molly Bolly. You are so loved. It's the new "Just Say No." Schools are posting the message on bulletin boards and preaching it during Morning Meetings and school culture assemblies. It's part of an anti-bullying movement, included in lessons about bystander awareness. If you see someone being treated unjustly, if you see someone being bullied or intimidated or discriminated against, if a friend confides that she is thinking about harming herself, if you see a threat posted online, speak up. Say something. I talk to my own kids about it. "It's not tattling, it's reporting." There are situations that are too big for a kid (even a big kid) to handle on his own. It's not your responsibility to hold this information or to fix the problem, it's your responsibility to tell someone who is in a position to do something about it. Isn't it funny how it's hard to take your own advice sometimes? The kids' grandparents gifted them tickets to a local children's theatre production for Christmas. The show was Huck and Tom, a quick one-hour Cliffs' Notes version of the novels by Mark Twain. We saw the show this past weekend. It was a small auditorium, with eight or so rows on three sides of a small central stage. The actors were adults but the show was geared to little kids, so there was a lot a singing and exaggerated facial expressions. The kids enjoyed it. It's after Huck and Jim run away. Huck has the grand idea to sneak back into town to hear the news...is anyone looking for them? Do they know that Huck has decided to help Jim escape? To properly sneak, though, Huck needs a disguise. What better disguise than to dress up like a girl?! Oh, the hilarity! As soon as the plan was announced, I felt prickly. I glanced down to the little boy sitting beside me, who had chosen his favorite skirt to wear to the show. He was watching, listening intently. The scene proceeded...Huck is helped into a dress and the cast points and laughs. Max watched. He giggled. The scene continued...exaggerated feminine prancing about the stage by the dress-wearing Huck, exaggerated, belly-clutching laughter by the cast. I watched Max watch. I watched as he began to survey the audience for their reaction. From our vantage point at the very back, we could clearly see every row of all three sides of the auditorium. We were surrounded by parents, grandparents, and children pointing and laughing at the hilarious absurdity of a dress-wearing boy. The skirt-wearing boy beside me saw it all. I wanted to scream. I wanted to cry. Instead, I fumed. All afternoon, all evening. I consulted with my most trusted advisors the next day...I told them that I wanted to scream. I wanted to cry....but I know that's just my overly sensitive Mama Bear coming out. I told them that it's not really that big of a deal...Max is fine. He enjoyed the show! Didn't say a word about that scene. He's fine. But it's not fine. It IS a big deal...and each of my advisors said the same thing: "You should say something." There was a handy Google forms submission link on the website. Hi! My family attended a performance of Huck and Tom yesterday. All three of my kids enjoyed it very much. I did want to bring something to your attention, though, that maybe had not yet been considered by your cast and crew. My 9-year old son has identified as gender fluid for years. He's been wearing clothing traditionally worn by girls since he was old enough to express an opinion about his wardrobe. He attended yesterday's performance in his favorite skirt. The scene in which Huck disguises himself as a girl was uncomfortable for me to watch while sitting next to my kiddo...not because of the scene itself (I do understand how central the scene is to the storyline) but because of what I felt to be unnecessary negative attention paid to Huck for dressing like a girl. I watched my son watch the cast point and laugh at a dress-wearing boy, and watched as he surveyed the audience for their reaction...more pointing and laughing. The scene could have been equally comedic, in my opinion, if the cast seriously and without humor, helped Huck find a great disguise (even a dress, if you feel it necessary to maintain the integrity of the original story), then played up the part of the scene where he couldn't keep his assumed identity straight. That part ("I'm Mary, or Sarah, or Mary Sarah!") WAS funny to all and didn't include poking fun at anyone for how they dress or how they choose to present themselves. You may not always have a dress-wearing boy in your audience, but you did on Sunday. I'd appreciate it if you gave some thought to my opinion. Thank you. I hit Submit, then felt like I was going to throw up. It's not easy to Say Something. I feel very strongly about my opinions but I HATE confrontation. I was on pins and needles anticipating a response, which I knew would come. It would be bad PR to ignore feedback like that. I wanted to reach out to thank you for your comments and concern about Huck and Tom. We are taking your comment very seriously. I will be having a conversation with the cast before our next performance to see how we can incorporate this idea. I'm sorry for any discomfort that either of you might have felt. It was never meant to be offensive and I am thankful for your pointing out this situation so we can address it and do our best to continue to be as inclusive as possible. To be honest, I was surprised by the response. In this day and age, where it is so common to deflect blame and to refuse to take responsibility for a mistake or a lapse in judgement, I was so grateful for this open-minded acceptance of my opinion and my family's experience. Will the show change? Maybe not. But maybe. And maybe there will be a dress-wearing boy in this weekend's audience who will not feel ashamed or confused by what he sees on stage. If you see something, say something (kindly). Even if it's hard. When you speak up, you might prevent someone from being hurt...you also might open someone's mind or heart....and with awareness comes progress. We've been on the receiving end of some pretty big diagnoses before. 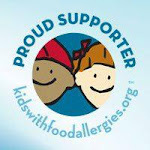 I remember weeping in our first allergist's office when 11-month old Evan was diagnosed with 13 food allergies. I remember being told that allergic reactions can get worse with repeat exposures to allergens...making that post-anaphylactic reaction trip to the ER even scarier in hindsight....worse than THAT?! The doctor had asked why I was crying. Um...really?...I'm the mom of a baby who was just diagnosed with POTENTIALLY LIFE-THREATENING ALLERGIES to milk, nuts, peanuts, wheat, egg, fish, shellfish, barley, oat, rye, black pepper, green olive, and cantaloupe. And you want to know why I'm crying? We switched allergists. Then there was the time I sobbed in the office of the Pediatric Gastroenterologist upon learning about Evan's Crohn's disease. I had actually handled the initial news pretty well...we had been properly prepared by our pediatrician. It was when the GI doc said, "Listen, mama, my primary goal here is to get Evan to 18," and I practically screamed "WAIT. That's NOT A GIVEN?!" that I lost it. The doc had meant "Get Evan to his GROWTH POTENTIAL by the age 18," and he ultimately clarified as much, but the details were tragically lost in the initial statement. Today's diagnosis, in comparison, pales. While immune-system-related and chronic, like Crohn's and some allergies, psoriasis isn't life-threatening. It won't require daily oral medication and the looming possibility of infusions, surgeries, and scary complications. An accidental exposure to a common dietary staple found in just about any kid's lunch box is not going to threaten her life. But still. Psoriasis? She's only 6. That's a looooooooong life of inflammation management in her future. It all started the day we moved out of our last house. Molly was pokey, but we were busy and, to be honest, we were moving ourselves out of one house and into a storage unit and I didn't have time for a sick kid. When she fell asleep on a broken down cardboard box in the middle of the garage-turned-Moving Day-staging area, I finally realized she might be coming down with something. I felt her burning forehead, unearthed our Tylenol, and dosed her. She managed to perk up and we continued on with the move. For the next week, while we began our 3-month stay with my parents, she was more sick than I'd ever seen her. Scary high fevers, lethargy, couldn't eat...she was in pretty bad shape. We tested her for strep, but the rapid test was negative. Finally, two long and feverish days later, the culture came back positive and we were able to treat her. About a month later, we were wrapping up the school year and, amidst the busyness of teacher gifts and final projects and fifth grade graduation, I noticed a rash on her that I hadn't seen before. She's a sensitive little thing, though, so I chalked it up to seasonal allergies or a contact reaction...a dab of hydrocortisone did the trick and I didn't think much of it again. Over the next six months, that rash did not go away. It would flare up, then get better again, but it never cleared up completely. We had a couple of consults with our pediatrician, but were ultimately sent to dermatology at the beginning of December. He mentioned a strep-related psoriasis strain that happens sometimes in kids. I finally flashed back to Molly's scary bout of strep last spring and gratefully connected the dots. Strep-related psoriasis! He would give us a cream, knock out the rest of that virus and cure that rash once and for all! Easy peasy! Except the miracle cream didn't work. In fact, while she was on it, she came down with a cold and her symptoms flared up again. We went back today for a follow-up. Psoriasis, yes. Strep-related? More like strep-triggered. More like over-active immune system. More like....chronic. She's fine. She's under the care of good doctors and we, mercifully, for now, have health insurance. We'll add another specialist to our docket, another couple of trips to the pharmacy each month, and another entry in our Family Medical History diary. We'll be fine. I googled. I know I shouldn't have, but I did...just very quickly. I peeked, just for a moment, at comorbid conditions. Psoriatic arthritis, depression, cancer (particularly nonmelanoma skin cancers, which, thanks to my basal cell, she already had a family history of...)...and Crohn's disease. As we walked back through the hallways of the large teaching hospital after our appointment, I looked at the dozens and dozens of people around us, heading to or from appointments of their own. Hundreds more in the rooms above us. How many of them, or their loved ones, received or will receive a difficult or life-altering or annoying or complicated or devastating diagnosis today? In the grand scheme of life, we got off easy today. We'll manage. She'll be fine. Maybe it's because I'm so angry about the state of our nation these days. Maybe I would feel exactly the same even if our healthcare industry (and everything else) wasn't in complete shambles....but I think what Molly's diagnosis (and Evan's before hers) makes very clear to me, is that, even with insurance, this is going to cost us a lot of money. From specialist co-pays to the high cost of prescription drugs....we're going to be hitting deductibles and making good use of our health savings account. Having kids with chronic conditions is EXPENSIVE and that's not right. I can't help but think about the kids with rashes similar to Molly's, or anemia similar to Evan's, who can't go to a doctor because their parents can't afford to bring them. Their symptoms aren't "bad enough." Their little bodies coping the best they can but struggling against chronic inflammation. I can't imagine having to weigh the severity of the symptoms vs. the cost of the appointment. I am so grateful that we don't have to make those hard choices, but I am so angry that so many in this "greatest country in the world" do. Of those people in the hospital today who received news they didn't want to hear, how many will go bankrupt as a result of their disease? How many will need to set up a GoFundMe to help them cover the cost of medical treatment? The number isn't zero. And that's the problem. Our country, in so many ways, is broken. My faith in our current system is shattered. I am looking to the 116th Congress, sworn in just days ago, to bring some common sense, problem-solving, and decency to the table. Restore my faith. Rebrand this country as one for liberty and justice and healthcare for ALL. I'm hopeful...prove me right. A few months ago, Max started creating a card game based on the Warriors book series. Similar to Pokemon or, if you're lucky enough to know about it, the Harry Potter card game, the game Max is working on consists of Warrior Cat cards, which players can collect, in addition to "power," "element," and "adventure" cards that you use in playing the game. The goal is for your Warrior Clan (which consists of the cats you have collected) to gain superiority over the rival Clans. It's pretty brilliant and he's making all the cards by hand, which is impressive. Dozens of cards and the rule book, which make up the game-in-progress at the moment, live in a well-organized folder under Max's desk. Next to it is a well-organized collection of recipe cards, cook books, and pages ripped from food magazines because, in addition to the Warriors Project, Max is also working on his Baking Project. On a shelf across the room is a binder with tabs separating the information Max has accumulated and the knowledge he has acquired in the fields of Biology, Chemistry, Physics, Astronomy, and Geology. Because Max is also working on a Learning About Science Project. Then there are the Geography and Cultures folders that Max is using the teach Molly World Studies in his School Project. I won't even mention the various works of art and "creations" that live at the Art Table in the basement. The other night, as I was tucking him in bed, in his room littered with the folders and binders and boxes of his works-in-progress, Max said to me, "You know what, Mommy? I think I need a project." I took a deep breath before reminding him of ALL the projects he's currently working on...It's not that he doesn't finish what he starts, although that is sometimes the case, it's that he is constantly seeking his next big obsession. When Max dives in to something, it's with everything he has.....until something new catches his attention. He'll go back to previous projects, though, so we must save everything. Everything. All of it. All the time. He went on to tell me that having a project calms his mind. I SO get that. The over-thinkers of the world will agree: having something creative and concrete to let your mind play with keeps it from ruminating on the worries and the anxieties that sit beyond our realms of control. We need projects to keep our minds settled....I just wish Max's didn't leave a literal trail of project mess destruction in his wake. I try so hard to honor his creative process and let him do his thing, but the papers and the supplies and the piles Drive. Me. Crazy. I wish I could lighten up. I wish I could let it go. Maybe that's MY new project. This kid is as spunky and sassy as ever. But there's a maturity that's growing. And with it, an awareness of this world that I have mixed feelings about. On the one hand, because of the time and place into which he was born, Max has a healthy awareness of who he is and how he identifies. He has role models who are out and proud (BIG thanks to the Queer Eye guys...JVN, in particular) and friends and a community who accept and love him completely. On the other hand... a third grader shouldn't worry about bad people bringing guns to the Pride celebration we attended last month. Max did. A little kid, who identifies as gender-fluid, shouldn't know that the LGBTQ community, his community, is sometimes targeted and discriminated against by hateful individuals and even our own political leaders. Max does. A nine-year old shouldn't know that Nazis came to our city...the same Nazis who hate people "like him" just because of how he feels comfortable dressing. Max does. He's growing up so fast and, sometimes, I just wish we could live in that blissful little bubble of innocence and youth forever. But we can't. And growing up is hard. I'm constantly impressed by how gracefully and confidently Max is doing it. Fashion Glasses. No prescription, just style. Max has been in a bit of a worst-case scenario spiral lately. After the concerns about gunmen at Pride, we dealt with a hurricane in our local forecast. Though we were spared the worst of the weather, the anticipation of the potentially dangerous storm shook Max to his core. Then, on Tuesday, as we were leaving his fiddle lesson, his teacher said, "See you next week, Max!" Max replied with a sigh, "I sure hope so." When I asked what he meant by it, he responded, "Well, we'll probably be here, but maybe not! Literally ANYthing can happen between now and then! You just never know..."
I think it's developmental. I think this worst-case scenario-ing is the result of a highly sensitive child processing deeply emotional what-ifs. It's his new, expanding worldview impacting his still undeveloped emotional brain. He's a work in progress, that Max. But he's not all doom and gloom. He is, after all, sugar and spice. Max's small business brainchild, Sprinkles on Top, has finally come to fruition...years after he coined the name. Thanks to a willing friend (who's mom has agreed to split the kitchen time! ), Max's bakery has had two after school pop-up shops, with more in the works. He's also rhythm and melody. This kid can sing. Play some Taylor Swift and pretend you're not listening to him and he'll belt it. My favorite time with Max is during our weekly drive to fiddle lessons. He plays DJ while I navigate the downtown, rush hour traffic. We blast Taylor and Lady Gaga and Pink and he knows EVERY word (even the lyrics that make me cringe to hear him sing...ooooh, boy....growing up is hard AND educational). We've mentioned voice lessons or joining a choir, but he's a sing in the shower kind of kid...if he's going to be on stage, it'll be with a fiddle under his chin. Bluegrass Queen. I was so thrilled by his decision to start up with the fiddle once again after taking a break for the summer...and not just because it is not, now, just another one of Max's started-then-neglected projects. Watching him learn something new...something challenging that he doesn't pick up instantly and effortlessly...is such a joy. Growing up is hard...but it's beautiful, too. I wish I could shield him from the big fears and worries he's been processing lately. I wish I could keep him wrapped in the cocoon of safety and security and the complete freedom of self-expression that we lived so comfortably in when he was little. I can't take away the worries, but I can support the projects that keep his mind busy and calm. I can ignore the mess and the clutter and embrace the creativity. I can't keep the dark parts of this world from him, but knowledge is power and Max will do great things with all that he'll learn and experience. His patience and compassion are endless. His ability to see the best in someone, anyone!, puts me to shame (I still firmly believe that people are just the worst). Max is kind and thoughtful and so exceptionally bright. Max is a good egg. The world is yours, babe. I can't wait to see what you make of it. It's going to be FABULOUS.